Pilaf is a delicious, hearty and nutritious hot meal consisting of meat and rice. Mainly used for pilaf pork, but it can also be cooked with chicken, beef, and lamb - at your request. 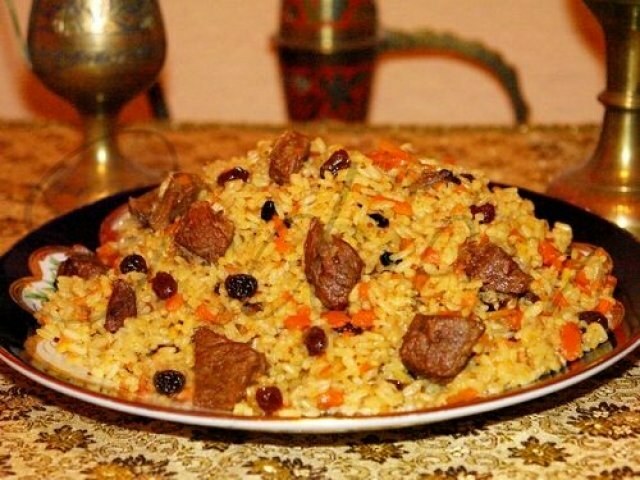 In order to make real, high-quality plov it is necessary to observe the ratio of products. Remember that meat, rice and carrots need to take 1 kilogram, not more and not less. The lamb must be without bones and flesh, we only need 2-3 slices on ribs for fat content and taste. Rice is better to take oblong, steamed, not boiled and it is not sticky, but stays loose and for a good pilaf. Meat for proper risotto should not be washing, you can blot it with a wet cloth and only in case if it got any dirt or dust. Carrots must be cut with a knife thin slices, do not RUB it on a grater or grind in a blender. The bow can take any quantity to taste, but be sure to stock a little onion, so she took all the harmful substances fried oil. Rinse the rice until until the water is clear. And, of course, you should use a cauldron – cast iron or aluminum. - seasoning for pilaf (cumin, barberry). The cauldron heat, pour the sunflower oil and drop a small onion for 5 minutes, and then catch it and throw it away. Fry the lamb chops for 10-15 minutes, remove from the pot and place in a bowl. Fry in a cauldron in the same butter cut into small pieces the onion. How much will fried onions, depends on the color of pilaf, which in the end you'll have a Golden or white. Add the onions chopped into small pieces of lamb meat. Fry it in a pot over high heat, stirring occasionally so as not burnt. Meat that is fried, not braised! To browned meat put carrots, cut into thin slices. Let it soften for about 5 minutes, then stir in onions and meat. Cook 20 minutes, stirring constantly. Pour into the cauldron boiling water to the top to keep the meat and vegetable mixture all the way there disappeared. Add the previously fried ribs, seasoning, garlic, pepper and salt. The taste of the water should be slightly salty. Reduce heat and allow to boil the mixture for 40-50 minutes. Again, turn the fire to full capacity. Pour into the cauldron rice, flatten it and fill with boiling water just above the grains. While cooking the rice, stir impossible, it's generally better not to touch. Simmer under the lid closed for about 1 hour, add water as needed. When grits are tender, correct the pilaf is ready. Now it needs to be mixed, and then put it on plates.